On October 12, the UB Alumni Association recognized 12 outstanding alumni and friends and many other school-based awardees for their achievements and bringing distinction to UB. This year's on-campus celebration included dignitaries, alumni, colleagues, family and friends. Alumni accomplishments significantly benefit both society and our university community, advancing the common good and inspiring others with passion and creativity. Please enjoy these wonderful memories of our time together celebrating this year's honorees! 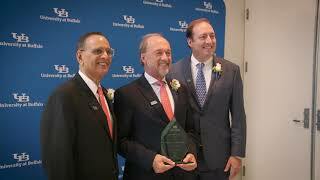 The University at Buffalo and the UB Alumni Association honor the accomplishments of these individuals. Click on their award to watch the acceptance videos. Still serves as the managing director and co-founder of Seabury Consulting, now part of Accenture. He has more than 35 years of experience in consulting and management of transportation systems. 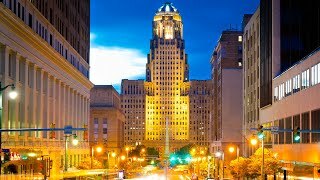 As health commissioner for the Erie County Department of Health (ECDOH), Burstein works with the community to address our region's most urgent health issues. A senior executive with more than 30 years of experience, Castellani started stocking shelves in 1962 for his family’s upstate New York supermarket chain, which became Tops Friendly Markets. Known for his student-centered philosophy, commitment to the community and inclusive leadership style, Davies is now the 15th president of Central Michigan University. Ezrati is chief economist at Vested, a financial communications agency, a role he began in 2016 after leaving the same position at Lord Abbott, one of the oldest investment firms in the country. President of Maricle Health Advisors LLC, Maricle is a Fellow in the American College of Healthcare Executives. After graduating from UB, Noonan didn't question what to do next. He knew he wanted to make music—so he moved to New York City and took on the name Willie Nile. Family values, hard work and integrity are the principles Nakhoda uses to build on the successful company his Indian ancestors began in 1890 when they arrived in Singapore. Today, he is director of F.M. Noordin & Co. Pte. Ltd.
Schulz, professor of mechanical and materials engineering at the University of Cincinnati, is an expert in developing smart materials and devices based on nanotechnology through interdisciplinary research. Severin is associate dean for medical education and associate professor of anatomy in the Jacobs School of Medicine and Biomedical Sciences. While a UB student, Hanna was involved in a variety of organizations ranging from the Student Bar Association to the Lebanese Student Association and beyond. After earning a bachelor's degree in English and a master's degree in library science from UB, Kelly pursued her childhood dream to work in business and used her librarian skills to earn a master's degree in business administration from the Rochester Institute of Technology. Do you know a someone who should be recognized? Submit an Alumni Achievement Award nomination today!